A few years ago, when I was heading the History honors program, I invited Tony Judt, the director of the Remarque Institute at New York University, a noted historian of modern Europe, and a prominent “public intellectual,” to deliver the annual Allabough lecture. Scheduling problems prevented him from accepting, but we kept in touch, tossing possible dates back and forth, to bring him over at another, future occasion. This is now unlikely to happen. 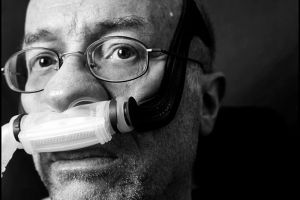 Diagnosed with amyotrophic lateral sclerosis (ALS, or Lou Gehrig’s disease) in 2008, he is presently quadriplegic, using a breathing apparatus and a microphone to communicate. I think it does. It really does. I know that sounds funny, but I believe the reason is this: that all I ever wanted to do in life professionally [and] occupationally was teach history and read and write it. There are times when I’ve thought, ‘My God, you’re a dull man, Judt. When you were 13, you wanted the same thing, and now you’re 62 and you still want it.’ And the upside of that is that I get as angry at bad history writing, or the abuse of history for political purposes, as I ever did. (It reminds me of a Kamagurka joke about Mick Jagger: “Do you realize Mick Jagger will be sixty-seven this July ?” — “So what? I’ve been sixty-seven all my life.”). Judt’s mind is as sharp as ever, as he demonstrates in wonderful short pieces (“Memories”) currently running in The New York Review of Books, perfectly structured essays which he conceives and composes in his head (sometimes during his sleepless nights) and dictates. You can read them online (on so-called “Revolutionaries” in the fifties and sixties, on Identity–or multiple identities–, on working as a young man in a kibbutz during the 1960s, or my favorite, on the peculiar institution, still alive and well, of the Cambridge Bedder); or do the right thing and buy a subscription to the New York Review of Books. For the price of a few pizzas you’ll be supporting the best–and most historically minded–magazine of intellectual life in the U.S. The kind of publication that continues to give Tony Judt a voice. This entry was posted in Historians and tagged WS by Walter Simons. Bookmark the permalink.